Did you know about the "Save" and "Publish" option in Wolf PaaS Designer? 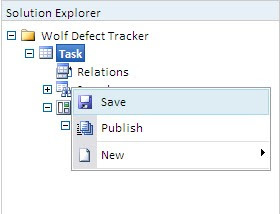 Ever notice the "Save" and "Publish" buttons in the Wolf Design Environment and wonder what they are all about? The "Save" and "Publish" options enable any changes you make to reflect instantly in your Web app. 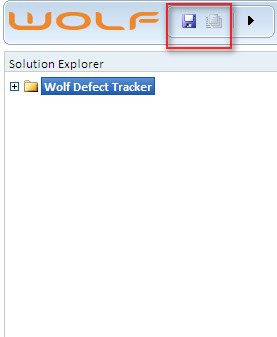 Firstly, let me familiarize you with the various locations of the "Save" and "Publish" options in the Wolf Web Based Application Designer . The top of the Wolf Designer comes equipped with the "Save" and "Publish" buttons to allow easy saving and publishing every time a change is made. In addition to these buttons, every node in the Wolf Designer which is currently being worked upon presents the "Save" and "Publish" options when it is right clicked. As the name itself implies, the "Save" button enables you to save all the changes that you have made to your current node. However, this option only enables your changes to be saved. Your changes do not reflect in your web app just yet. The "Publish" button enables these changes to reflect in the Wolf Run Environment instantly , i.e., the saved changes reflect immediately in your web application. Once the action is complete, the user gets an alert specifying that the action is complete and can view these changes in his web application. Let us consider an example to illustrate this. Lets say the User wants to change the name of a field in an Edit Screen in the Wolf Designer Console. The User goes to the Edit Screen, selects the field whose name needs to be changed. Assigns the new name to the field. Clicks "Save" to save the new name of the field. Then "Publish" the changes so the new name now reflects in the Run environment of your Application. The User also has the option of saving a set of changes made to an app before publishing them. On Publishing, all saved changes will reflect in the web app .